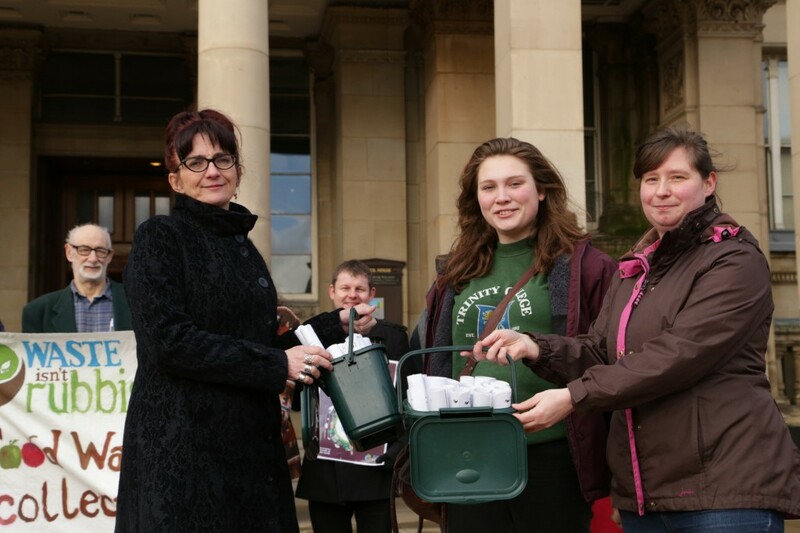 On Tuesday 12th February campaigners handed in the Waste Isn’t Rubbish petition in kitchen caddies to Lisa Trickett, Council Cabinet Member for Sustainability, outside the Birmingham City Council House in Victoria Square. 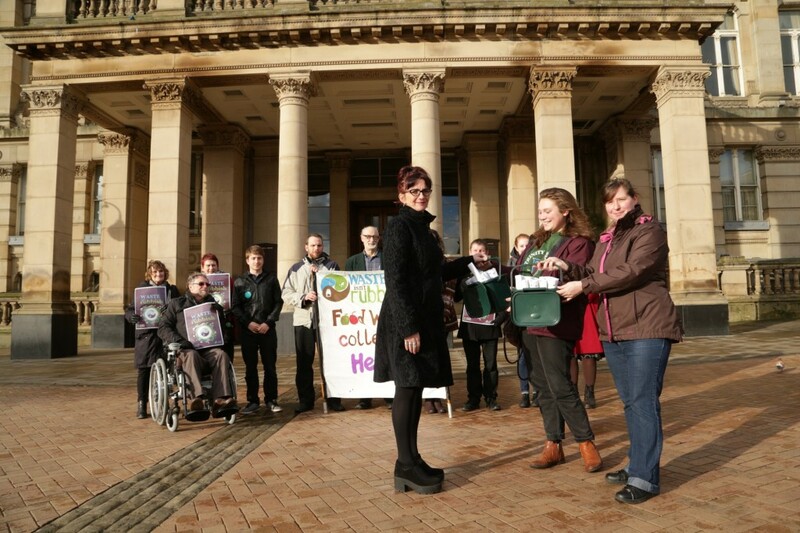 As well as over 1300 members of the public signing the petition, the campaign has gained support of community groups from across the city, including several Neighbourhood Forums, Birmingham LGBT Centre, and Chinese Community Centre. We were joined for the hand in by members of Eco-Sutton and Banners Gate Neighbourhood Forum. Lisa Trickett then presented the petition to the afternoon’s full council meeting. The hand-in comes as Birmingham City Council is looking at its waste strategy with the end of the Council incinerator contract with Veolia in 2019. Making it easier for people to recycle food waste by providing a food waste collection and more support for home and community composting. Making it easier for people to recycle more types of waste from home. Using local companies to process the waste. 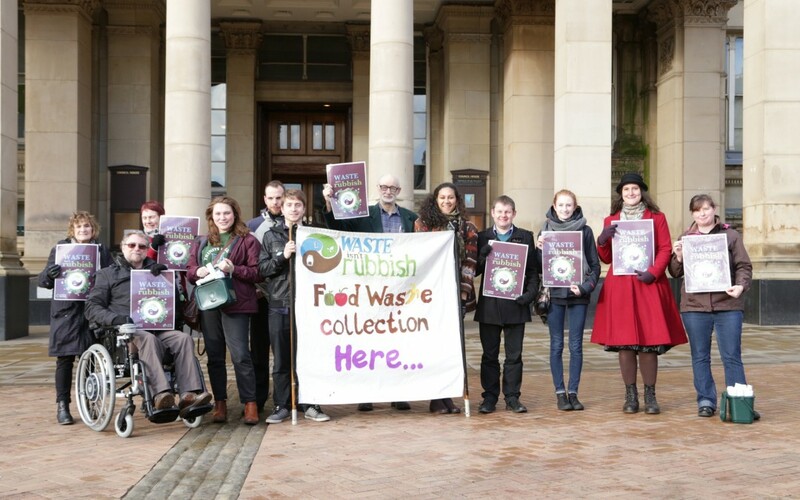 Birmingham City Council will consult on its new waste strategy this year and we’ll continue pushing for a zero waste Birmingham, which would mean the Tyseley Incinerator is no longer needed. Birmingham City Council has been found to be the worst local authority for reuse and recycling in the West Midlands. The figures from Defra show that the city council recycled less than 27% of household waste during 2014-15 and produced 641.6 kilos of residual black bag waste per household. These figures are worse than any other local authority in the West Midlands and than any other core city. “We’ve had fantastic support from people and communities from across the city. Together we’re demanding the waste system we need, that makes best use of the resources in all our waste, instead of letting them go up in smoke in an outdated incinerator. With the Council contract with Veolia up in 2019, now is the perfect time for the Council to rethink its waste strategy. “Waste is a rubbish fuel and yet 41% of the residual waste sent to the incinerator is organic matter. By keeping inedible food waste seperate and sending it to an anaerobic digester, it becomes a cleaner, renewable energy source. “Seperating out organic matter also means we can make better use of all the resources in our waste. This would mean the incinerator is no longer needed, leading to a reduction in CO2 emissions. Dear friends of the Earth, My name is Pete Barratt and I work for Birmingham city council as the street scene coordinator of the east side of the city . It is new role and I have three other colleagues who cover the other three quadrants of the city. I am passionate about the work I am doing and we are trying to change the throwaway waste culture of the city. Impossible maybe, achievable possibly if we all work together in a more coordinated way; by that I mean, get rid of red tape / barriers and really focuss on what needs doing and how we all get there together. I would love to work on partnership programmes with Foe on the East side of the city, both in education and practical recycling projects to reduce waste and inefficiency. I really hope that we can meet up soon to discuss future projects .